A 19-year-old suspected leader of a kidnap gang, Ismaila Wakili, has been arrested by Ondo State Policemen with four other members of his gang after reportedly demanding N30 million from their victim. Those paraded by the state Police Commissioner, Undie Adie, in Akure, Ondo State capital include Abdullahi Sanni, Mohammed Abdullahi, Umoru Usman and Sheu Usman . This came as the state police command said security measures had been scaled up around bank premises across the 18 local government areas of the state to prevent attack by bandits. Addressing newsmen, Adie said the victim, who is a staff of Nigeria Institute for Oil Palm Research, NIFOR, in Edo State, was attacked by unknown gunmen numbering six along Akunnu Akoko/Auga Akoko Road in Ondo State. Adie said the suspects dispossessed him of N185,000 before demanding N30 million ransom for his release. He noted that “it took the spirited efforts of our men to track the kidnappers to their hideout in Ibilo, Edo State. “On April 3, 2019, a team of Policemen with members of vigilante group trailed the kidnappers to their den at Ibilo, Edo State. “After exchange of gun fire, the kidnappers fled to unknown destination, leaving behind one pump action, one double barrel and two single barrel guns. The victim escaped to a community in Ibilo where he explained his ordeal in the hands of the kidnappers. “The Police placed the community on red alert to watch out for any strange face. Thereafter, one Ismaila Wakili ‘m’ aged 19 years, from Niger State, whom the victim later recognised as one of the kidnappers, was arrested and handed over to the police. The CP alleged that the suspect led a team of detectives to the hideout of the hoodlums at Aduwawa in Benin City, Edo State where the four other members of the gang were arrested. He said the suspects will be arraigned at the conclusion of investigation by police detectives. In an interview, Wakili denied knowing the four other suspects, adding that the botched operation was his first. On their part, the four other suspects said they have never set their eyes on Wakili and that they were arrested where they were smoking Indian hemp. The commissioner, while speaking on the bank robbery in ldoani where seven people were killed on Monday, said: “We want to assure you that we are on the trail of the suspects involved in the two unfortunate incidents and we will not rest until they are brought to face the full wrath of the law. In related development, men of Ogun State Police Command have arrested three members of a syndicate who specialised in stealing children from their unsuspecting parents. The Police Public Relations Officer in the state, Abimbola Oyeyemi, told newsmen that the syndicate’s mode of operation was to use two of their members to disguise as couple looking for an apartment to rent, especially in a place where children of their interest reside. 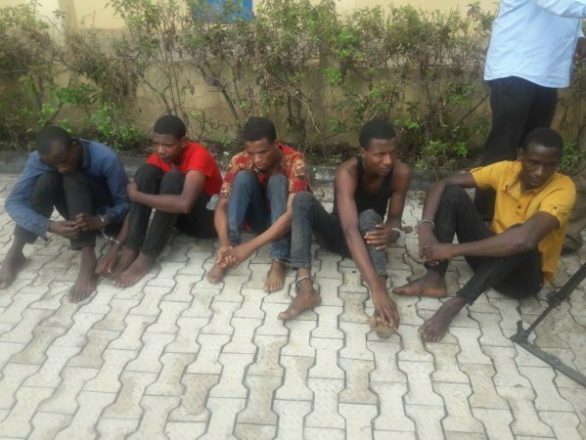 He said: “They have succeeded in stealing eight children from different locations in Ogun State and sold them to their buyers in Anambra State, consequent upon which the command launched serious manhunt for members of the syndicate. “The suspects are Kate Njoku, Joy Okorie and Onyeka Joseph. One of the children recovered from them, Temidayo Ajayi, who was abducted with his brother in Sagamu since July 2018 has been reunited with his parents, while efforts are on to recover his brother from the gang. “The suspects have all made useful statements to the police on how they stole the children and sold them to their accomplices in Anambra State”. The PPRO, however, disclosed that, the Commissioner of Police , Bashir Makama has ordered a thorough investigation of the case with the view to bringing other members of the syndicate to book. “He equally appealed to parents to take the security of their children serious by not leaving their wards in the care of a total stranger.